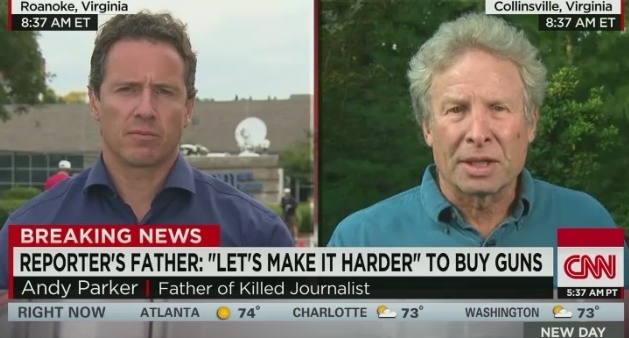 Andy Parker looked into the camera and spoke directly to CNN’s Chris Cuomo and the media covering the live shooting of his daughter Allison. This astute comment really stuck me. I don’t know his background, but he is exactly right about how the media works. Parker wants change and is urging people to call their senators. That’s great, but because of his daughter’s profession I think he could also lead a change in how the media covers gun violence. Here are some suggestions on what he could do and how you could help if you are interested. Have Parker contact the media directly on follow-up stories about shootings. This is the reality of our celebrity culture. Parker now has standing as a type of celebrity. Journalists will take his calls. But he needs to offer more than just another interview with a shooting survivor or grieving loved one. What new story can he bring the media? Stories don’t move forward unless some new information is revealed or an event happens. Now is the time to ask different questions that can reveal new information. He can also talk to the media about how they cover other non-shooting gun-related events. I have some ideas about that, but I’ll save them for another piece. Most journalists aren’t aware of all the ways the pro-guns activists have blocked change in multiple areas. That’s because it’s not news–until the next shooting. Now it’s up to our activists to connect the dots for the journalists, to reveal the corrupt process that blocks sensible laws, then show how funding is cut or how enforcement is lacking. They also need us to name names. These could be interesting stories for the print media, but isn’t dramatic enough for TV. That needs another tact. Make it personal and local. The NRA knows emotional stories like Parker’s are especially powerful right after a shooting. They have already criticized Parker for being too emotional. The NRA counts on the media’s short attention span. They also know the media has a problem covering the long game played at the state level by lobbyists and politicians. But what if we used one media problem to solve another? Each new shooting is an media opportunity to see why previous proposed changes either stalled or were blocked in different states. This gives the media a current news hook to use but without the, “It’s too soon” attacks. They also have a local angle to follow up on. It moves from a “too soon” national story, to a “what happened to this?” local story. This idea is probably too risky for broadcast TV, but it could be done. Maybe somebody will set it up and put it on YouTube. I mean seriously, most of us have the power of a portable TV studio in our pockets, learn to use it in ways other than hilarious cat videos. The point is to get answers to the question they ask now after every shooting, “Why was there no big change following Sandy Hook?” Listen to the answers and then figure out how to do something different this time around. I understand why people get overwhelmed by this issue, even when it happens to one of their own the media throw up their hands and say, “There is nothing we can do.” But there is. We can take advantage of the medias’ own coverage formulas to move the issue forward. We just need to act. I’ve laid out several suggestions here based on real experience. I have more for other media, but now is the time to help the broadcast media do their job better. There is hope. Positive change in how the media covers gun violence is possible.